he fantastic revolution taking place in the quality of Portuguese wines continues. At the cutting edge are some brilliant winemakers making both everyday wines of great value and character and also exciting new wines of unprecedented quality for this ancient wine-producing country. The Douro, followed by Alentejo, provides the greatest riches and the Dão renaissance continues apace but there are exciting wines from nearly all the major regions. For white wines which have improved in leaps and bounds, Vinho Verde leads the charfe with some exceptional varietal Alvarinho and Loureiro wines and, at the highest level, the Douro impresses.There is still much poor wine at lower levels and even moderately ambitious efforts can show winemaking faults or a lack of balance – but the best wines from leading producers can be tried with confidence. Portugal’s burgeoning middle classes consume the lion’s share of the best wines and have pushed up prices but increasing quantities are exported and a very many new, exciting wines are being introduced every year. The five leading varietals in this spectacular region were identified in the 1970s as Touriga Nacional, Tinta Roriz, Touriga Franca (previously called Touriga Francesa), Tinta Barroca and Tinto Cão. Some consider a sixth, Tinta Amarela, to be equally important. Though all were often planted as field blends that might include any number of other varieties, there has been an increasing trend towards planting by single variety. Where it is feasible on the steep schistose slopes, quality-conscious producers now favour vertical plantings (as used in the Mosel) with a resultant increase in density. But these vineyards co-exist with old-fashioned (occasionally single-row) terracing (socalcos) and the bulldozed terracing (patamares) that were introduced in the 1970s and allowed for greater mechanization. In the west of the region the Serra do Marão range of mountains has a significant effect on the climate. There is a successive drop-off in average rainfall in stages from relatively rain-soaked Porto to Régua (Baixo Corgo – the westernmost of three sections), to Pinhão (Cima Corgo), to the dry, flatter lands of the Douro Superior (close to the eastern border with Spain) where there is some use of irrigation. Producers have shown it is possible to get grapes fully ripe in the Baixo Corgo around Régua, though they are likely to be hardest hit in rain-affected vintages. Cima Corgo is the classic port country with the greatest concentration of ‘A’ classified vineyards (vines are classified A to F) and most of the famous quintas. A quinta defines a farm or estate which may be composed of vineyards of more than one grade. The quintas overlooking the Douro are important but so are those found on several small tributaries, especially those from the valleys of the Rio Pinhão and the Rio Torto. Here the greatest differences in character, structure and styles are discernible from individual terroirs. Although many of the classic Vintage Ports are sourced from here fine port is also made in the Douro Superior which has seen a frenzy of planting for table wine as well as port by some of the region’s leading players. 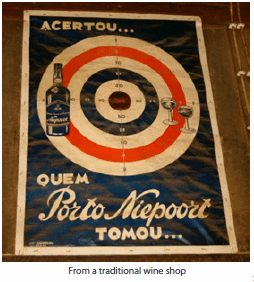 Port has traditionally been stored at the port lodges in Vila Nova da Gaia (opposite the city of Porto, on the north bank of the Douro), but since 1986 it has been permitted to make, store and ship port at its source in the Douro. Quinta do Noval and Quinta de la Rosa were two of the first to take advantage of this but it is necessary to have cool cellars if the wines are not to take on a distinctive baked character known as Douro bake. New lodges are air conditioned with humidity carefully controlled. Although autovinification is common for most ports, the best Vintage Ports are made by fermenting in lagares. Traditionally this involves treading by foot (though this is now being closely imitated by robotic devices) which allows the rapid but gentle extraction of colour, tannin and extract in the 48 hours or so before the fermentation is arrested by the addition of port brandy. Temperature control of lagares and the chilling of brandy are also used to harmonise this addition and avoid a spirity component in the resulting port. Most table reds were previously made from inferior grapes or sites, but in the past two decades leading producers have established potentially high-quality sites (or harnessed the potential of existing sites) specifically for Douro reds, resulting in a remarkable revolution in both the quality and quantity of premium examples. Port grapes have been deployed to produce fine table vines, both younger plantings and established vines too. Elevation and cooler north-facing sites come into their own for table wine, especially the whites. The best wines impress not only with splendid fruit, depth and structure but also the stylish minerality that vine age and the Douro’s soils can bring. As with port, some of it is coarse, baked or unattractively earthy but the best are rich, elegant, complex, perfumed and characterful. 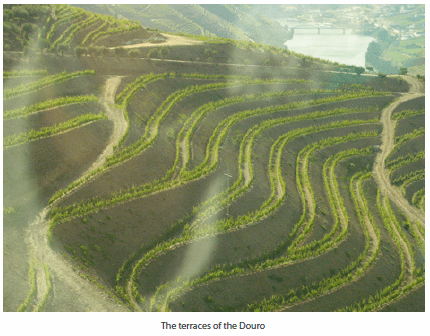 Douro has been long-regarded by the Portuguese as the country’s finest wine region for red table wine (and whites too). Some Douro reds can honestly be described as some of the world’s finest wines and whilst prices are creeping up, they are still very affordable by Bordeaux / Burgundy / Tuscan / Napa (etc.) standards. The list of top wines is now too extensive to summarize here but Alves de Sousa, Lemos & van Zeller, Niepoort, Poeira, Pintas, Quinta do Crasto, Duas Quintas, Vale Dona Maria, Vallado, Wine and Soul, Quinta do Passadouro and Quinta do Vale Meão all include at least one of the region’s benchmark examples. Minho is very unlike most of the wine growing regions of Portugal. It is warm but damp – sometimes very damp due to its coastal Atlantic influence – think of a muggy summer’s day in the UK. Whereas Vinho Verde used to be a bit of a joke, it should now be taken seriously from the best producers. Really decent Vinho Verde (or Vinho Regional Minho) made in the Rios do Minho region, has been, at least until recently, very rare. Despite changes to viticulture, a tradition of high yields and the damp climate can make it difficult to get Alvarinho (the best grape), Loureiro, Trajadura or other grapes fully ripe for the white version that is widely exported. However several good producers, including Quinta do Ameal, Anselmo Mendes and the particularly refined Alvarinho from Antonio Esteves Ferreira (Quinta do Soalheiro) lead the quality charge and are attracting a flurry of new names like Galician Marcial Dorado. Beiras, a large, predominantly agricultural region to the south of the Douro, includes both the Bairrada and Dão DOCs. Labels showing simply Beiras Vinho Regional can be wines that fall outside the regulations for these DOCs as well as wines from the wider region. The Portuguese do not consider Beiras a good region for wine and excellent vintages can be few and far between in Bairrada. The biggest problem is rain and the diseases which can result from it. The heavy clay soils are largely planted to the Baga grape which is high in both tannin and acidity and it can be difficult to achieve full ripeness in its tannins. Nonetheless wines of great depth and character, if idiosyncratic style and flavour, are possible and much progress has been made in recent years. The out and out star is Luis Pato (and increasingly his daughter Filipa – see below) but there are several other good producers including Dão Sul (Quinta do Encontro), Campolargo (who work with French varieties as well as Portuguese), the much under-rated excellent traditional style of Sidonio de Sousa as well as offerings from the estimable Caves Aliança, Sogrape and others. Also try the modern-styled, Beiras labelled Calcário from Filipa Pato (Luis’s talented daughter) and Quinta das Bageiras. The best wines come from silty soils of the valley bottoms rather than the underlying clay. The Dão has granitic sandy soils and is less exposed to the coast than Bairrada. Though once associated with tough, tannic reds that only occasionally showed well with considerable age (and having a reputation with the Portuguese as only fit for marinating meat! ), the last decade has seen a dramatic improvement in quality and there has been increased planting of Touriga Nacional and Tinta Roriz on well-sited hillsides. Both grapes have been produced varietally as have Jaen, Alfrocheiro Preto and even some Tinta Cão, though these grapes generally perform better as part of a blend. The best estates now offer rich, ripe but characterful reds, among the country’s most food-friendly. Fine quality whites have also been made from Malvasia Fina and Encruzado, the latter particularly promising in gently oaked varietal examples. There is an increasing diversity of styles – every wine student needs to jot down Quinta dos Roques/Maias and Alvaro Castro (Quintas Pellada and Saes) at the top of their shopping list but there is plenty more besides including the top reds from Sogrape’s Quinta dos Carvalhais and Dão Sul. Top Beiras reds are also made by João Portugal Ramos (especially Quinta de Foz de Arouce). Rarely encountered outside Portugal are wines from the Beiras Interior region, sandwiched between Dao and the Spanish border to the east, most famous for its city of Castelo Branco. It is a low-lying, mainly dairy farming region with largely deeply weathered clay soils, which would not be an obvious choice for wine production but watch this space – there are exciting pockets of ambition. Look out for Quinta da Baixo and Quinta dos Currais. Lisboa, previously known as Estremadura, covers undulating hillsides north of Lisbon but despite its proximity to the coast it avoids much of the cloud cover and rain of more northerly maritime influenced areas such as Bairrada and Vinho Verde. It has long produced more wine than any other region, much of it from large co-ops. But here, too, things have improved and a handful of individual estates are emerging with some creditable wines. Alenquer is the most important sub-regional DOC. The region still needs more excellent estates like the Tavares da Silva family’s Quinta de Chocapalha and José Bento dos Santos’ Quinta do Monte d’Oiro in order to gain a wider international recognition. DFJ Vinhos are based here too but also make good wines from other regions. In Tejo, previously known as Ribatejo, despite many high-yielding vineyards, there is some good value to be had where a top winemaker has been contracted to make the wines. Newcomer Vale da Algares has raised the stakes with its no expense spared state of the art winery and upmarket white Viognier and Viognier blends. It will be interesting to see how their reds perform with a bit more vine age. Both regions have a smattering of foreign varieties, including Cabernet Sauvignon and Syrah, but premium, sometimes varietal, examples of Portugal’s best grapes are far more important. One grape, Castelão (Periquita), brought to the region by José Maria da Fonseca in 1830, dominates production in Península de Setúbal (previously known as Terras do Sado) and nowhere else does it work varietally quite so well. The best smoky, minerally, earthy, spicy examples are sold as Palmela (a more defined area of mostly sandy soils on the Setúbal peninsula) or Península de Setúbal. A new wave of producers are fashioning some promising if sometimes, over-ambitious premium and superpremium wines with the help of leading consultants like Mouchão’s Paulo Laureano at Soberanas and Pegoes’ Jaime Quendera (Casa Ermelinda Freitas). These are typically sourced from relatively young vineyards planted to Portugal’s flagship varieties (especially Touriga Nacional and Aragones) and French varieties (notably Cabernet Sauvignon, Syrah and Alicante Bouschet). Based on Muscat of Alexandria variants, Setúbal and Moscatel de Setúbal (predominantly Moscatel) are famous fortified wines of good quality, particularly from José Maria da Fonseca and Bacalhôa. The still relatively small, scattered vineyards of Alentejo lie close to the Spanish border on the eastern side and are drier and less maritime influenced. Viticulture in the modern era is a relatively recent phenomena but quality estates now abound. Most of the top Alentejo reds are blends based on Trincadeira and Aragonês (Tinta Roriz), with Castelão, Alicante Bouschet or even Cabernet Sauvignon as minor components. Syrah has been made varietally and shows promise in a rich, powerful if slightly earthy, robust way. Ripe, sound, attractive whites are on the increase (grapes include Roupeiro, Antão Vaz and, for acidity, Arinto) but only a handful show sufficient depth or structure to improve with age, though this is slowly changing. Unsurprisingly top estates look to their premium reds to underpin their emerging reputations but the future looks exciting. Those that must be tasted include the best wines from Herdade do Mouchão, Fundação, Eugénio de Almeida, Cortes de Cima, Esporão, Quinta do Mouro, Quinta do Zambujeiro and João Portugal Ramos. Relative newcomers have also shown their worth, notably Malhadinha Nova, but also, Herdade do Rocim, Herdade dos Grous and Quinta de Dona María established by Julio Tassara de Bastos after he sold the Quinta do Carmo brand. In the very south of Portugal there has not been the same level of quality hitherto but progress is being made. 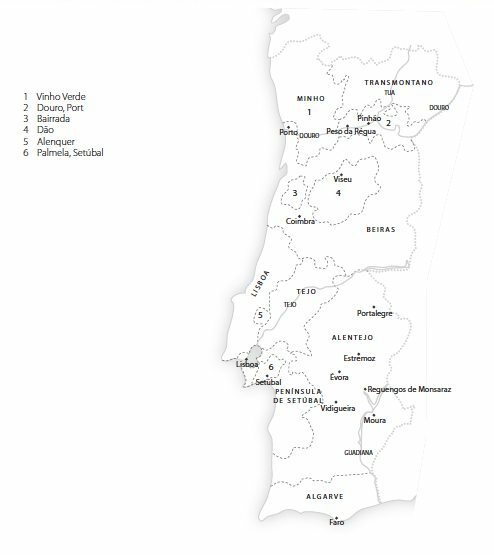 Not considered to be a sensible wine growing region by many Portuguese, it has relied in part on outside investment and ideas. Monte da Casteleja and Quinta do Frances also show promise, with terroir-driven wines. Cliff Richard (Adega do Cantor) is using a similar mix of grapes to the Alentejo to good effect in his Vida and Onda Nova reds and whites. In recent years there has been increasing experimentation with non-indigenous varietals such as Syrah and Sangiovese, with varying success. 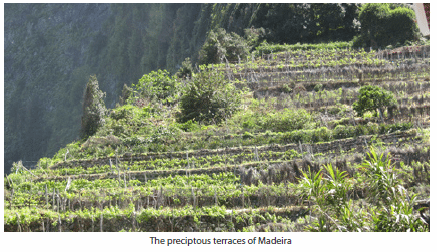 Madeira is made by a small number of shippers who for the most part buy grapes from the island’s many small growers. Tinta Negra Mole dominates their vineyards but the best Madeira comes from the slowly increasing amounts of the traditional varieties. The wine needs to be made from at least 85 percent of either Malvasia (Malmsey), Bual (Boal), Verdelho or Sercial to be labelled as such. As well as being fortified, fundamental to Madeira’s style is a high level of acidity and a degree of caramelisation due to heating. Most Madeira, especially the stuff used for cooking, undergoes the estufagem process which involves a period in a hot store (estufa). The best wines, however, are made by the canteiro system, whereby the wine is only subjected to natural heating in cask over a period of three years or more. As a result the wines are less coarse and have less of a burnt-sugar flavour. Each of the traditional varieties is associated with a certain degree of sweetness. The greater the sweetness, the higher the percentage of spirit in the wine as the fermentation is arrested at an earlier stage to retain a higher sugar level. The richest and sweetest, Malmsey – often pungent, full and toffeed – is usually the most easily appreciated but most examples miss the elegance and definition associated with the smoky, spicy, dried-fruits Bual (Boal), which is less sweet but still a dessert-style wine. The best Verdelho (of moderate sweetness) is often tangy yet lightly honeyed with dried citrus fruits and a certain delicacy of flavour and aroma. The dry Sercial, often with daunting acidity, can show a fine citrusy (orangey), nutty and dried-fruit complexity with age. The best commercial styles are the 10-year-old and 15-year-old wines. The age indicated will be an average as the wines are blended to maintain a consistent style. Even from the best shippers, 3-year old Madeira will almost invariably be made from Tinta Negra Mole and is likely to involve the addition of caramel and the use of concentrated must. Traditional vintage Madeira will have spent at least 20 years in cask but many of the very best have spent 50 years or even 100 years in wood. Once bottled it continues to age but at a very slow rate. As they are only made in tiny quantities and sell for high prices it is imperative to consult a specialist. An exciting recent development is Colheita Madeira – wines made from Mole from a single year crafted with traditional varieties or Tinta Negra Mole and which have spent at least 5 years in cask. Brighter in style than Frasqueiras, they combine charming upfront appeal without sacrificing complexity or structure and are kinder on the pocket! Rare examples of two other traditional grapes, Moscatel and Terrantez, are also occasionally encountered. The English Gentlemen’s drink of old is undergoing a renaissance and even at the finest level, represents very good value for money (compared to say top Bordeaux or Tuscany) for the opportunity to try some of the world’s finest wines. There are two basic styles of port: those matured in bottle and those aged in wood. Of the former, Vintage Port applies to any port that meets the requirements of the IVP (Instituto do Vinho do Porto or Port Wine Institute) and is usually bottled before the summer of the second year after the harvest. While the title implies the ‘declared’ vintages bearing a house name, it applies equally to single-quinta ports and ‘off-vintage’ ports (or ‘second label’ – a shipper’s port from a non-declared year, increasingly made as a true single-quinta example). These wines, which may be bought through a wine merchant or agent prior to being shipped, will always require decanting. Late Bottled Vintage Port (or LBV) – a style purportedly invented by Taylors – spends four to six years in large vats and the majority are fined and filtered to avoid any sediment forming in the bottle and are ready to be consumed when released. ‘Unfiltered examples (labelled Traditional’ until 2002) however, more closely resemble Vintage Ports in character and depth and, though they must be aged for a further three years in bottle before release, are not necessarily ready to drink when released. Some, having only the minimum bottle-age, will improve for a further five or six years. LBVs are often remarkably good value but only the very best can approach a Single Quinta vintage port in the quality – the latter often not being much more expensive (usually double the price but LBVs are not that expensive). Though the name is very important in the port houses’ pecking order, it is more than just a name – there are clear differences in style. For example, the two ‘big boys’ – Grahams and Taylors make noticeably different styles – the former being sweeter and fruiter, the latter being richer and drier with the distinctive violets aroma. Crusted Port, like Traditional LBVs and Vintage Port, will throw a sediment but is a blend of two or three vintages rather than one and the year given is that of its bottling. Of the wood-matured styles the most credible are those tawnies with an indication of age. Though extensively blended to maintain a house style, these gently oxidised styles can show considerable complexity and refinement. The quality of 10-year-old Tawny Port is, however, extremely variable and in many instances the quality doesn’t match the price. At worst they are simple, coarse and tired but better, fresher, balanced examples can show a date, nut, fig and toasty complexity that is seen more often in examples of the more pricey 20-year-old Tawny Port. 30-and 40-year-old examples are variable (sometimes excessively volatile) and expensive but at their best have an intense, nutty rancio character and complexity not dissimilar to an aged sherry. Colheita Port is effectively a tawny port of a single vintage and is labelled with both the year of the colheita (harvest) and bottling year. They have a minimum of seven years in cask and can have all the qualities of the best tawnies with an indication of age but don’t always have the fruit to further improve with extended bottle age. Colheita tawnies from the best houses, such as Calem and Ramos Pinto are truly superb examples of the port maker’s craft and represent some of the best wines that Portugal can offer. The most commercially important port is the relatively inexpensive Vintage Character or Premium Ruby. The best offer good fruit intensity in an easy drinking style. Brand names supplant style in the minds of consumers. Regular Ruby Port is very young, fruity port (at best) while some basic Tawny Port is simply a poor Ruby cut with some White Port. The latter, from white grapes but turning amber with age, is usually best avoided as many taste sweet and doctored. A few are dry and nutty with some refinement. As of 2005, it has also been possible to market aged dated white ports – Andresen, Quinta de Santa Eufemia specialise in this category and make excellent wines, nutty, but lighter and more elegant in style than their tawny counterparts. Finally, as of 2009, Rosé Port has received official recognition on the back of “Croft Pink”, the pioneering rosé launched in 2008. Best served chilled or on ice, it’s finding its niche as a cocktail.